I have an Emerson alarm clock I got many years ago. It does everything I want in an alarm clock: it has bigass numbers I can read without my glasses, dual alarms, a day-of-the-week display, battery backup, and auto-daylight savings time. But my wife hates it because she thinks it’s ugly. You can see the supposedly-ugly alarm clock on my nightstand on the left of this photo of my bed covered in the parts of the new dresser I assembled this past weekend, with no help from my cat. So no, it doesn’t fit the overall vibe she’s creating in our bedroom. I found this fake wood alarm clock at Target, that sorta goes with what she likes, but it may or may not have a battery backup, and has no day display or auto-DST setting. Oh, how I shudder at the horror of having to remember what day it is, and re-set my clock twice a year! Looking on Amazon, there are countless versions of the same basic idea of a fake wood looking digital alarm clock with even less features than this one. There’s also several sellers packaging the same thing called a “dementia clock” for elderly people who can’t remember if it’s morning or night, but it’s like an 8x10 picture frame which is a bit excessive, and, you know, I don’t have dementia. 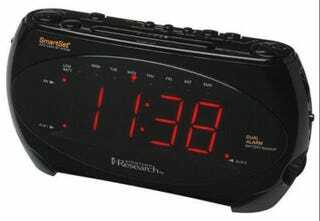 Somebody, please find me a clock that has all the features I like of my current alarm clock, but also blends with the decor better, so my wife stops talking trash about my “ugly” alarm clock! UPDATE: Holy crap, all of you said “use your phone” at the same time! I like to be able to see what time it is without having to fumble around with a phone, and I have terrible vision so I need the big numbers to be able to do this.